Some people are blogging for sharing experience, hobby, story, and another personal thing so they tend to choose personal blog template. Another people are blogging for make money online by joining Adsense program. Create a high quality content blog, design adsense ready theme/template, and attract your visitor. You need simple and clean blogger template to optimize ads placement. Me and my friend have created simple black ads ready template, suitable for make money online blog. We have considered 4 placements of ads, for illustration you can check the demo blog. Right sidebar you can put 250x250 ads size. 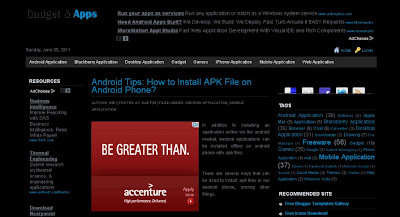 The clean dark background ease you to adjust Adsense color. Thanks for nice review. It is such interesting to read. Try to work with Qualco in debt collection business. thank to share a great template for adsense. i hope this usefull for us. This template is really beautiful and i love this color combination. Thanks for sharing this beautiful templates. here. I read that you need to have a site, that it is simple to open and it doesn't hurt your eyes after readings so much. light colors and a simple template. Black and ready magazine so nice and more interesting Magazine because in this Magazine so entertainment and enjoy so that can be more enjoy it. it's wonderfull template...i like it ..
Template, and attract your visitor. You need simple and clean blogger template to optimize ads placement.Mostly people are very like it and enjoy it in this blogger so nice and interesting blogger.